We return to the Bird Shots series in this week’s Weekender. Capturing birds in flight requires a fast shutter speed, a steady hand, and a knack for predicting the future. Photographing birds in flight is one of the great challenges of bird photography. Your subject is not only in motion, it is free to move in any direction in a three-dimensional space. It could be tempting to give up on in flight shots altogether, if it weren’t for the fact that flight is a defining feature of all the birds that live around us. In flight bird photos are a challenge, but they’re a must. In general, you will want to use a fast shutter speed to freeze motion, and you’ll need to learn to track the movement of birds as they fly. A good way to start is to shoot birds passing overhead, like Magnificent Frigatebirds at the Great Salt Pond. 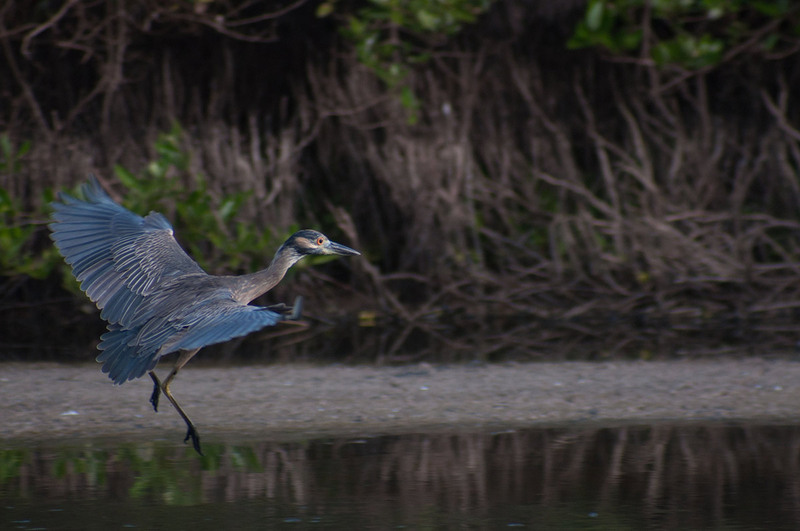 Often, these birds are gliding around at a leisurely pace, making it a relatively easy shot. For this kind of photo, you’ll choose a subject and track it as it flies around. In general, the closer the better, but for birds in flight, the closer they are the faster they seem to move, so for in flight photos the sweet spot may be in the middle distance. (Someone running ten feet in front of you passes in an instant but seen from a mile away they would move very slowly through your field of vision.) Blue sky in the background is better than clouds, and you will also want to avoid having the sun directly behind the bird you are photographing. Takeoffs and landings are very dynamic moments that can be great to capture. They also have their own advantages. When photographing a takeoff, you may not know when the bird will choose to fly, but you know where it is. Birds typically slow down when landing, giving you a little bit more time to get a great photo and making it easier to freeze the motion. In both cases, learning to predict the future is a key skill. What does a bird do right before it takes off? Many birds will bend their legs to spring up from the ground or leap away from a perch. If you can learn to spot this, you get an extra split-second warning that your moment is arriving. If you’re tracking a bird through your viewfinder, you can look for a bird dropping its legs in preparation for a landing the way that a plane lowers its landing gear. This week, spend some time watching birds to see how they take off, fly around and land, and then find a spot where you can photograph some birds in flight. We will also feature some additional tips and techniques at lesfruitsdemer.com throughout the week. 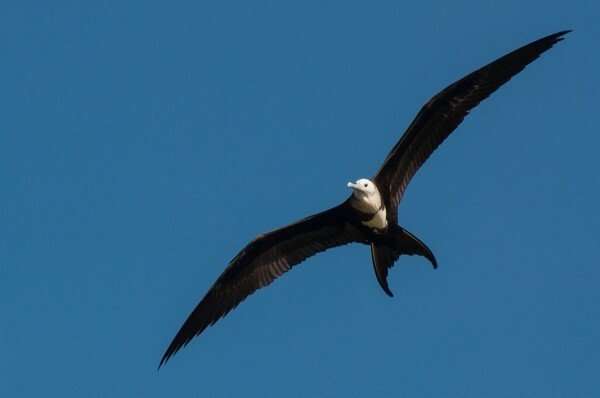 A soaring frigatebird makes a great in flight subject. Birds slow down to land, making that a great time to take a photo.